A 2-rail demolayout which support GT-command, and games GD1 and GD2 + more, and facilitates multiple trains and automations. To be folded for transportation. This layout using Lenz, but could be any Uhlenbrock, ESU, Märklin, Roco, TwinCenter etc. Size 196 x 107 cm inclusive borders. Transportation protected after folding. Can be in the back of a normal Stationcar. Notise the 2 wholes in the fold line for wires and PC's and monitors etc. 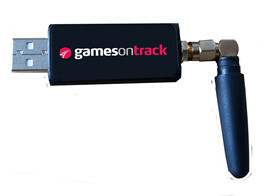 GamesOnTrack A/S exhibits at the Toyfair 2019, this time for the 10th time in a row. We are proud about the innovation we have brought to the driving of model trains and model cars using our patented indoor GPS system and the strong commitment to substitute wires with radio. Our product program supports many different customers, ranging from the professional developers for the real Railway like Universities and large control system developers for new safe solutions, over clubs and drone solution developers to private individuals who just want a smarter and modern way to drive and develop. This year we bring new and smaller components to the market based on our small transmitter and compact radio. Come and see how the new N-Go set can save your customers a lot of time, money and cables. And come and learn how we innovate together with Faller in order to bring smaller cars to the Faller Car System Digital. You have a LEGO(R) Train Testlicense Card. In cell phones voice control has been an option for some time, however very few people use it. The problem is that the model assumes you as a user to train the phone and learn the device your way of speaking. And you forget how you trained the phone, thus is does not work after a while again. Gamesontrack is different. We use already spoken standard libraries created by 1000-4000 people from most parts of the country. For any model train enthusiasts wiring and cabling under the layout is a major challenge. Countless are the wire bundles, which from time to time have be scrapped when the layout is built on. And countless are the error searches where a problem must be found among a jungle of wires, where the color, the bundling, or the mark up is not up-to-date. But the worst is probably that many enthusiasts and many young people think it is too cumbersome, and therefore throws himself over the alternatives. There are many ways to do automisation of a model railway layout. The traditional method deals with doing all the security stuff as a copy of the real railway. That means putting a lot of electronics under the tracks for how to adjust points, turnouts, occupation of blocks etc. Gamesontrack introduces a somewhat different method with focus on easiness and simplicity in order to get as much as possible to operate in a controlled way.